Formula E driver Lucas di Grassi, right, here battling eventual winner Jean-Eric Vergne, was issued one strange penalty after Saturday’s race in Uruguay. “After checking the clothes, helmet and FHR (frontal head restraint, or HANS device) of the drivers it was found that the driver (wore) short flame-resistant underwear pants which are not allowed by the ISC (international sporting code),” according to an FIA bulletin. The reigning Formula E champion and former Formula 1 driver was fined 10,000 Euros and given three penalty points, but was allowed to keep his first podium finish of the season. – Like most young racers around the world, landing a Formula 1 gig was the goal for Luis Filipe (Pipo) Derani. And as happens for most young drivers, landing an F1 gig quickly became an unattainable goal. That’s unfortunate, because the 24-year-old Brazilian is on his way to becoming a RacinToday.com top-10 road racer in terms of skill. After determining sports car racing would be his home in 2014, he immediately began to impress. His twisting road eventually brought him to America and IMSA where, again, success quickly followed. With the ESM team as co-driver with Scott Sharp, Ed Brown and Johannes van Overbeek, Deroni, in his first race in America, won the Rolex 24 in Daytona in a Honda Ligier. In that win, it was Derani at the wheel in the final stint and it was Derani who hunted down, caught and passed the Wayne Taylor Racing Corvette DPi to get the win. On Saturday at Sebring, Derani impressed once again. He drove an ESM Nissan Onroak DPi to victory, giving Derani a second Sebring win. To add a little heart to the story, Derani dedicated the victory to his seriously ill father. “I’m glad he could see me win one more time,” Derani said tearfully. – A look at the results from Saturday’s race at Sebring virtually guarantees that Balance of Performance will be back as a topic of debate: DPi cars dominated the LMP2 cars. DPi cars took all of the top-10 spots in qualifying on Friday. And on Saturday, four of the top-five finishing spots. – Overall, Fox Sports on-air broadcast team did a decent job at Sebring. Then there is Justin Bell. I guess people in living rooms must like Bell’s brand of schtick as he still has his pit-reporter gig. Maybe it’s the cranky journalist in me, but this: he’s not funny; he’s condescending; he doesn’t ask questions but makes statements and then gets not answers but reaction to his pontifications; he seems to think he’s the story and not those whom he is interviewing. Here’s hoping that broadcasting buffoonery as a genre in race coverage – as epitimized by the likes of Bell, Michael Waltrip and Robin Miller – will wind down and then depart some day soon. – Wind always comes into play and can mess with the cars. A couple hours into Saturday’s Sebring 12 Hour race, wind messed in an odd way. It blew a canopy from a trackside campsite onto the track. It brought out a yellow flag that put Helio Castroneves in the Team Penske Acura LMP2 car, who was pitting at the time, into the lead. – It was kind of refreshing to see Porsche and BMW not being kicked around by Corvette and Ford GTs in the GT Le Mans Series at Sebring as factory Porsche 911 RS cars finished first and third and a BMW from Rahal Letterman Lanigan finished on the middle step of the podium. Have the folks at Porsche tweaked their engine-forward configuration into a competitive situation and is the M8 the car that turns BMW in a frequent visitor to victory circles again? Or, does it preface BOP moves in that category? Whatever. It sure felt good for the P Car guys. – Something to consider in Formula E: Smaller is better for drivers because of the need for quick changes when switching cars. – Rating the top three races over the weekend: 1. Sebring 12 Hour race. It’s Sebring, the second best race in North America behind the Indy 500. 2. Formula E in Uruguay. 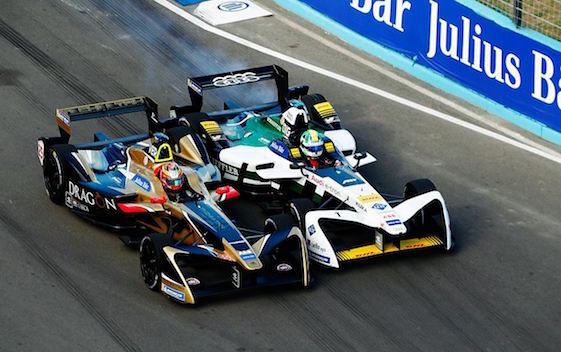 Great racing at front over the final laps as Jean-Eric Vergne, Lucas DiGrassi and Sam Bird banged away at each other. Vergne got the win but with DiGrassi right behind. 3. NHRA Winternationals in Gainesville. Actually, the big moment came in qualifying when Pro Stock Motorcycle rider Hector Arana Jr. broke the 200 mph barrier.